Before European settlement, the native population between the Appalachians and the Atlantic was estimated at over 1 million*. By the time the Mahicans settled in Stockbridge in 1734, the Native American population in Massachusetts was all but gone. What happened? A losing battle against European pathogens and European land hunger. In 1617-1619 a smallpox epidemic had swept through the original inhabitants of Massachusetts wiping out – by some estimates – as much as 90% of the population. The only thing that might have spared the Native Americans of the Berkshires would have been their limited contact with Europeans. 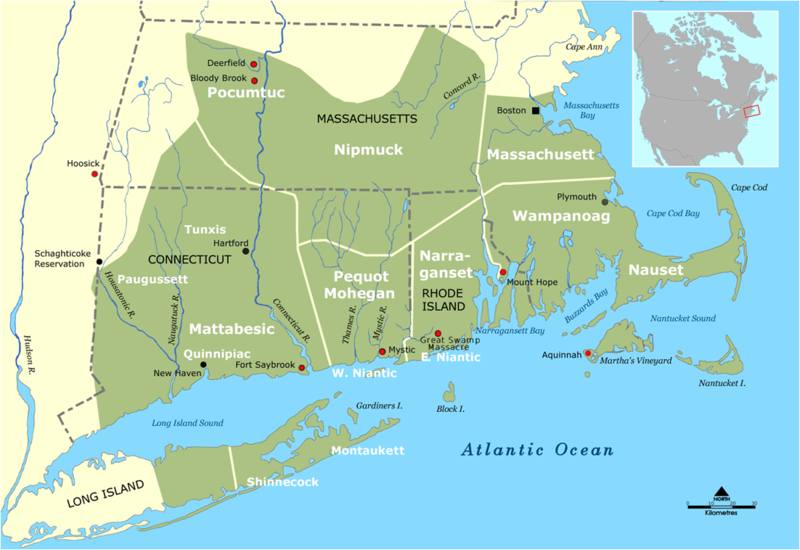 This now sparse native population plus a Puritan commitment to christianize the Indians, kept relations largely peaceful until 1638 and the Pequot wars. By the beginning of the 18th century, fighting between Native Americans and Europeans was generally incorporated into wars between France and England with different tribes either choosing or being hired by different sides. The primary tribe of the Berkshires was the Mahicans, Algonquin speakers that had made its home along the Hudson and Housatonic Rivers. They had lived by controlled woodland burns (to aid in the hunting of game), growing corn and squash, gathering edible fruits and nuts, and hunting deer and other animals. They did not clear cut for stationary farms as did the Europeans, but they did have to move on from time to time as soil and game wore out. As with other tribes, they were attracted to the steel implements, pots, trinkets and guns of the Europeans and traded to obtain them. The Mahicans were often “middle men” between fur trapping tribes and the English and Dutch. As noted in earlier posts, Native Americans had a somewhat different concept of property ownership than did the Europeans. They, particularly the Mahicans, considered the land theirs and thought it was only right to be paid for it. However, as far as the Native Americans were concerned, if the Europeans weren’t occupying an area, they could continue to use it. A number of elements of both the causes and outcome of the Pequot war would continue up to and through the era of the Stockbridge Indians. Although Native Americans started to acquire European weapons, warfare remained asymmetric. What we would call guerrilla war (and which served the colonials well during the Revolutionary War) remained the norm for Native Americans. These tactics (whether armed rifles or bow and arrow) worked well for raids and kidnappings but were no match for the disciplined lines of fire power employed by the Europeans. Racism and over-reaction were at work. At best Europeans had the somewhat patronizing view that they were doing a service in saving the natives from their primitive spiritual beliefs and bringing them Christianity. At worst, as happened to the defeated Pequots, there were wholesale hangings and sale of the defeated into slavery in the Carribean. 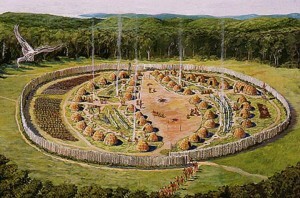 Images: Pequot Fort at Mystic from Miner Descent WordPress Site , Pequot Museum, Mystic, CT.
as much as the students.